Noise Attenuation for Fitness Equipment » HHP Associates, Inc. Single phase filters attenuate electrical noise generated by appliances as well as industrial, telecommunication, commercial, fitness and medical equipment. 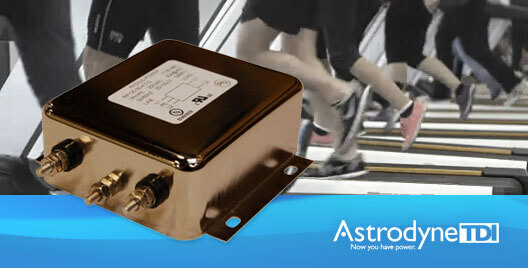 Astrodyne TDI single phase EMI filters attenuate noise generated by fitness equipment. In compliance with National (FCC) and International EMC Standards, Astrodyne TDI’s EMI filters can be obtained quickly and at a cost effective price. Typical applications for these filters include switching power supplies, motor controllers, PWM circuits, induction cooking and food service equipment, microwave ovens, induction heaters and other similar equipment. Single phase EMI/RFI/EMC filters are used to bring electrical and electronic products into compliance with National (FCC) and International EMC standards, such as CE and more. Astrodyne TDI’s single phase EMI filters carry US (UL), Canadian (cUL/CSA) and European (IEC/ VDE/ Semko) agency approvals and are available in both general purpose and low leakage current medical versions. At its agency approved in-house test facility, US, Canadian and/or European safety approvals can be obtained quickly and cost effectively on any of their customized and custom product, if needed. Off the shelf single phase EMI filter solutions are available from 1 A to 150 A. Current ratings up to 2500A are available upon request.